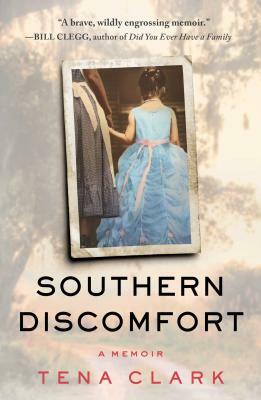 Southern Discomfort: A Memoir (Hardcover) | Fountain Bookstore, Inc.
Tena Clark has one of those stories which reads more like southern Gothic fiction, but is as real as it can get. A story of racism, infidelity, guns, booze and sexual identity in the deep south, Tena was born to a self-made wealthy family in Mississippi. Her father was a womanizer, her mother was a drunk, and typically the only reliable "parent" was Virgie, a hired housekeeper who was not allowed to eat at the family table despite her role in keeping the house and raising the children. Always a rebellious sort, Tena grew up confronting racism and homophobia, both from the townsfolk and from her own family, but she never gave up on either. This a beautiful memoir about the complexities of growing up in the south, and how family, in the end, is family. For readers of beloved memoirs like Educated and The Glass Castle, a riveting and profoundly moving memoir set in rural Mississippi during the Civil Rights era about a white girl coming of age in a repressive society and the woman who gave her the strength to forge her own path—the black nanny who cared for her. Tena Clark was born in 1953 in a tiny Mississippi town close to the Alabama border, where the legacy of slavery and racial injustice still permeated every aspect of life. On the outside, Tena’s childhood looked like a fairytale. Her father was one of the richest men in the state; her mother was a regal beauty. The family lived on a sprawling farm and had the only swimming pool in town; Tena was given her first car—a royal blue Camaro—at twelve. But behind closed doors, Tena’s life was deeply lonely, and chaotic. By the time she was three, her parents’ marriage had dissolved into a swamp of alcohol, rampant infidelity, and guns. Adding to the turmoil, Tena understood from a very young age that she was different from her three older sisters, all of whom had been beauty queens and majorettes. Tena knew she didn’t want to be a majorette—she wanted to marry one. On Tena’s tenth birthday, her mother, emboldened by alcoholism and enraged by her husband’s incessant cheating, walked out for good, instantly becoming an outcast in society. Tena was left in the care of her black nanny, Virgie, who became Tena’s surrogate mother and confidante—even though she was raising nine of her own children and was not allowed to eat from the family’s plates or use their bathroom. It was Virgie’s acceptance and unconditional love that gave Tena the courage to stand up to her domineering father, the faith to believe in her mother’s love, and the strength to be her true self. Combining the spirit of poignant coming-of-age memoirs such as The Glass Castle and vivid, evocative Southern fiction like Fried Green Tomatoes, Southern Discomfort is about the people and places that shape who we are—and is destined to become a new classic. Tena Clark is a Grammy Award-winning songwriter, music producer, and activist. She lives in Atlanta. Southern Discomfort is her first book. "Powerful, upsetting, and deeply hopeful, Tena Clark’s SOUTHERN DISCOMFORT is the brutal and true story of a family coming apart in a fracturing South told from the point of a view of a girl who makes peace with what she survived, fled and eventually came home to. A brave, wildly engrossing memoir." "Here is a slice of the late-twentieth century South that goes all the way to the bone, and that hurts a bit! – but it feels like it just got to be done. Southern Discomfort is a dysfunctional family romance with all the trimmings, and it will also tell you a thing or two about that time and that place that you didn’t already know." "A literary memoir, one that soars with the artistic flare of William Faulkner and Tennessee Williams on the complexities of the Southern family." "Raw and deeply honest....What Clark shows so beautifully is that the people she discusses, as unredeemable as they may at first seem, are much more complex....Clark’s narrative draws the reader in to a wonderful story of the South going from old to new." "Tena Clark weaves her deeply personal, private struggles together with the painful, shameful struggles she witnessed in Mississippi during the Civil Rights era in her beautiful, bravely shared memoir." "Tena Clark's memoir SOUTHERN DISCOMFORT, a true coming of age story, reads like a Tennessee Williams play. Set in the deep south where Magnolias, catfish, the Bible, guns, alcohol, racism and carnal knowledge collide, Tena's story confronts the heartbeat of America's identity crisis. A crisis of faith, family, freedom and truth. This story will make you laugh out loud, cry, and hope that one day you can stand as tall as Tena." "Tena Clark’s astounding memoir engaged me so deeply that I felt the pain of a lonely child in a chaotic home, and, happily at the end, the exhilaration of her hard won freedom. A wonderful read." "Tena Clark's riveting memoir shows us that even in the midst of fear, anger, and hate...tolerance, forgiveness, and love will rise. A triumphant journey and an inspiring read!"